New York City. If you can get beyond the swirling masses and head-scratching metro schedules, it’s not all that bad of a place. Especially if you’re in video production, where opportunities are aplenty and drone shots from far above the grids of Gotham look ready for the big screen. 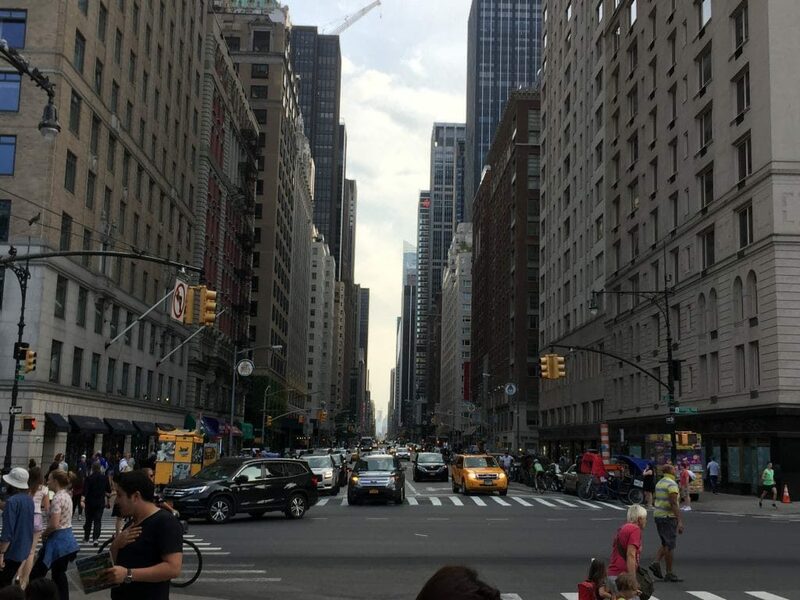 While LA may reign supreme in film production, we feel that due to the energy and seemingly endless resources at hand, there’s no better place to run a production company than right here in the Big Apple. With constant event coverage videos, corporate testimonial projects, live streams, and social media videos needing producing around the city, we’ve found it a thrilling place to call home for the last fifteen years. Over at ASL, we’ve learned that resourcefulness is the key to operating in the world of NYC video production. Through learning the ins-and-outs of insurance policies, film permits, and freight elevator usage, we’ve managed to make the complicated much more manageable. At just over 8.5 million inhabitants, the five boroughs that make up New York City boast a diverse patchwork of people that give the city an inimitable energy that is felt the second you arrive. Being the home to global and national corporate headquarters, a bustling entertainment industry, always-thriving tourism, and everything else under the sun, New York attracts talents big and small from all over the planet. And where the talent pool is big, the talent is, well, big. A huge advantage of creating video content in New York City is that the city is flooded by talented directors, producers, editors, camera operators, lighting specialists, and every imaginable asset to a production company possible. The unique thing about New York is the collaboration across industries. We could work one day with a prop master who just worked on a Broadway production or a camera op who is working a weekend sporting event. New Yorkers are as resourceful as they come and it shows through in NYC video production, where you work on a tight schedule that requires Olympian levels of flexibility. If the sheer size of the place is daunting, don’t worry, NYC video production can start to feel small in no time. Working with a trustworthy circle of talent is a nice way not only to make your world smaller, but also to ensure a level of trust that may not show through with a more transient crew. We’re lucky enough to have a network of specialists across industries, whether it’s an interview, events, product videos, or animation. Above all, we can’t stress enough the importance of having a roster of the talented, driven people that we’ve been able to work alongside in our NYC video production journey. It’s true that the internet helped play a big part in democratizing technology. No matter where in the states you live, you can get something that you need delivered within the week. Unfortunately, in video production, sometimes a week won’t cut it. On certain assignments, you’ll get no more than a day’s notice as to some gear, equipment, prop, etc. that you may need for a shoot. Lucky for us here, in New York, there’s an extended community of gearheads, rental shops, and production services to make sure that your needs are taken care of. Rental companies like Adorama, and sharing sites such as Share Grid and Kit Split make it easy and affordable to get the equipment we need in time for our shoot. In the video content industry, equipment gets pricey, so it’s highly unlikely that you can own everything you need outright. Putting gear up for short-term rental is a great way for individuals and companies alike to pay off those hefty equipment bills. For a recent shoot in Brooklyn, our client wanted to use Astera Lights (think: color changing, remote-controlled, light-saber-esque LEDs). We don’t have those! Lucky for us, there was a guy in Brooklyn a short drive away who was renting out his. In NYC video production, this kind of thing happens all the time. The sheer convenience of running projects in such a massive market allows us to take full advantage of the tools available to us. With our experience and connections in the NYC video production world, we’ve been able to get great deals on some of the latest cutting edge equipment. Whether it’s a gimbal, slider, drone, 4,5,6K camera, the odds are we’ve operated it, or at least have worked with someone who has. Yeah, that’s what they say. But it really is true that no city hustles like New York. 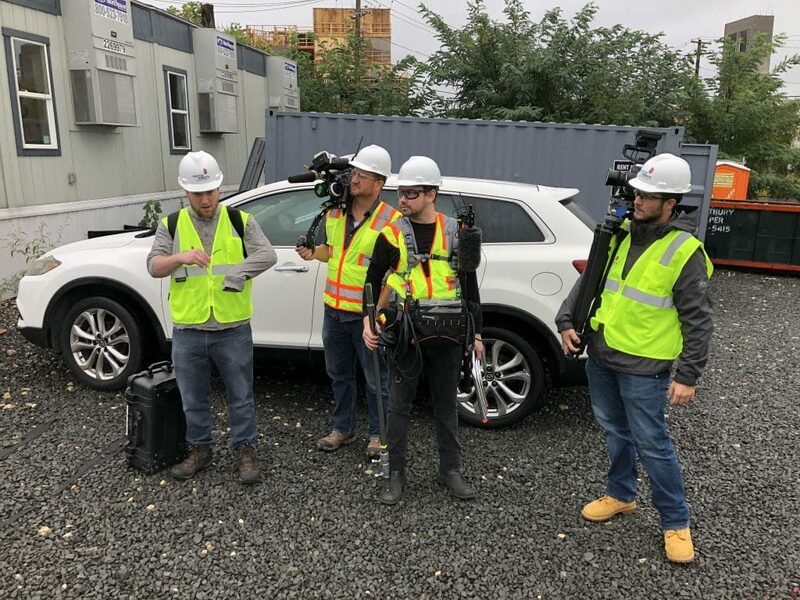 In video production, deadlines are crucial to maintaining healthy working relationships and we make sure that we always hire a diligent, punctual production crew that works at the same breakneck speed as the city itself. Oh yeah, another thing about New York: it looks great on camera. The timeless skyline, the bustling streets, and the dazzling diversity of the people moving through it all make for a one of a kind setting. 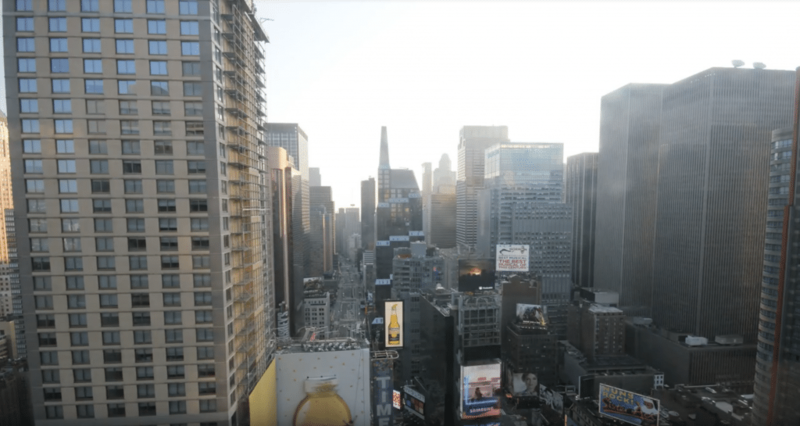 Not every video we work on features the character of New York City, but when it’s called for, we love texturizing videos with the sights and sounds of the city. For a recent fashion shoot, just as the sun was going down after a full day of shooting in studio, the director suggested trying out some outdoor shots. In just minutes, we were underneath the street lights and neon signs shooting beautiful new footage. Despite all the upsides of the city, it’s some of these same aspects that make New York a difficult place to film. Where a less experienced crew may be thrown off by the tricky lighting inside a skyscraper, we would know that a Joker (or other HMI light) would be necessary to match the sun’s exposure. It’s these kind of things that we take into consideration when planning our New York shoot days. NYC filming permits are notoriously complex, and our experience has certainly taught us that. Insurance requirements for high skyscrapers and government buildings alike are tricky to navigate, especially if you don’t want to purchase new insurance for every job. Luckily, we’ve learned to manage the insurance policies and deal with the freight regulations for skyscrapers. Once these hurdles are dealt with, executing a fluent NYC video production becomes a much easier task. With fifteen plus years in the bag, our producers know what to expect and how to navigate the curveballs thrown to us.